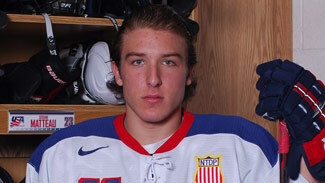 Forward Stefan Matteau of the U.S. Under-18 National Team Development Program knows he is much more valuable on the ice than watching his teammates from the sideline. Unfortunately, however, Matteau will be doing the latter on Wednesday when the USNTDP host the Muskegon Lumberjacks in a United States Hockey League matchup at the Ann Arbor Ice Cube in Michigan. Matteau, who NHL Central Scouting has ranked No. 13 among those North American skaters eligible for the 2012 Draft, will be serving a one-game suspension on Wednesday for spearing a player on the Green Bay Gamblers on March 1. Matteau had scored a pair of goals to give the NTDP a 2-0 lead before being issued a game misconduct for his spear with 53 seconds remaining in the second. The gritty Gamblers scored three unanswered goals in the third to ultimately win the contest, 3-2. For the season, Matteau has connected for 14 goals and 28 points in 39 games. He also leads the team with 151 penalty minutes. "I can't take bad penalties when the team needs you most," Matteau told NHL.com. "We were up 2-0 and I was playing pretty well. But you learn from these things. I guess I have to be smarter, but the way I play, I think I will get penalties. It's going to get better, but I'm a physical player." Matteau, the son of former 13-year NHL veteran Stephan Matteau, was asked if he is upset over the amount of time he's spent in the penalty box this season. "I don't like getting the penalty minutes, but I like that physical game that makes me a tough player, gritty player," Matteau said. Matteau racked up 67 PIM's with the U.S. National Under-17 Team last season and 98 penalty minutes with the Notre Dame (Sask.) Hounds midget program in 2009-10 prior to joining the NTDP. "I'm a big bodied power-forward, got a lot of skill and got a good shot and I play with an edge," Matteau said. "I like to bring an all-around solid game." The U18 NTDP will next host the Youngstown Phantoms on Saturday.